There’s been much speculation about which company is behind the controversial anti-Apple ‘Wake Up’ campaign currently going on in Australia. We previously reported that Samsung might be culpable but RIM has now stepped up and acknowledged that the creation is its. We can confirm that the Australian ‘Wake Up’ campaign, which involves a series of experiential activities taking place across Sydney and Melbourne, was created by RIM Australia. A reveal will take place on May 7th that will aim to provoke conversation on what ‘being in business’ means to Australians. The campaign caught attention last week when a flashmob of ‘protesters’ took to an Australian Apple Store to protest against the use of the company’s products. 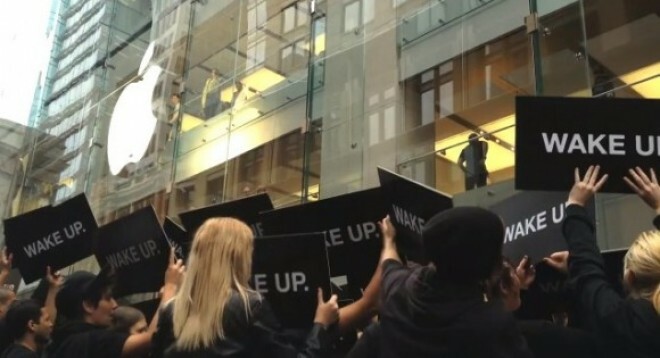 Those assembled chanted “wake up” and held placards decorated with the same message, while some protesters dressed as sheep, in another dig at Apple, popular products and cult following. The identity of organiser and its (apparent) purpose is due to be unveiled at 3:00 pm on May 6, but with RIM now out in the open, and the campaign receiving criticism the world over, it is unclear what more will be said. Companies that run flashmobs — which first grew popular as independently organised events — typically recruit participants by paying them, and it seems very likely that video blogger Nate “Blunty” Burr was also paid. Burr covered the protests with an ‘eye witness’ entry on YouTube, but has been recruited for past BlackBerry campaigns, as Macworld points out. The fact that RIM went to the trouble of paying participants and focusing on the negativities of a competitor could see this promotion backfire on the struggling firm. It remains to be seen whether loyal BlackBerry users will turn away from its device in Australia or other markets, certainly little positives can be taken so far. The admission from RIM came after Macworld tracked the Wake Up website back to the company, leaving it with little to do but come clean. Samsung had been suspected of carrying out the campaign as part of its teasers for its upcoming Galaxy III device, but the firm recent denied its involvement to Slashgear last week.